The way I’m going, this writer of the week might turn to be every two weeks. It’s the end of the week and I barely made it. But I have a good excuse. 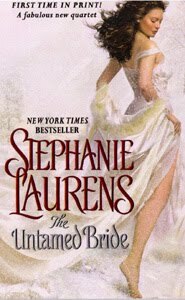 🙂 I got offered a new book by Stephanie Laurens to read and review, so when it arrived, of course I left everything else and went to read it. Well, what can I say. It’s a typical Laurens novel and that’s really good. The fact that this book comes with short info on all Cynster and Bastion club novels written so far has been some good thinking on someone’s part. It really made my reading much easier because it put into perspective what year each of the stories happened. You know, after, what? – 16 Cynster books and 8 or 9 Bastion, you kind of lose the details, so having them at the end of the book is really helpful. Especially so, as both Cynsters and Bastion club members feature in The Untamed bride and in the rest of the quartet to come. So, if I cannot have them/him in real life, I’ll live in the novel for a while and enjoy myself. You can certainly enjoy yourself while reading Laurens romance. Now, who of you wants to enjoy yourself reading the latest Laurens romance? 🙂 The lovely people who sent me my copy, also offered 2 copies to my readers (they’ve made me very happy, I have to say). The only unfortunate thing is the copies can go only to US, Canada or UK. If you’re interested in one, please say so until Thursday midnight and on Friday, I’ll announce the winners.